Today I’ll like to share my thoughts about two things, namely toddler and reading. Maybe you have a toddler at home and you’re wondering if there’s benefits to reading to your toddler. Or maybe you’re even wondering about the possibility of having your toddler learn to read. There’s been various campaigns especially in the US that promotes the benefits of reading to babies and toddlers. One big example is the Reach Out and Read organization working with medical providers in all 50 states to encourage early literacy, and give out brand new books to their visiting young patients during medical check ups. They are advocating the importance of early literacy and getting your child ready for school. Reading aloud is probably one of the most important things you can do for your fast growing toddler. As for the answer to the latter question about having a toddler learn to read, it’s possible! If you have the time and patience, you can teach your toddler to read at home. I say time because I know many of you are busy working parents. Even if you are, if you can set aside 10-15 minutes a day for lessons, that’s good enough. And I mention patience here because that’s what’s needed when teaching someone something new. I’ve done it and my son is currently 3 years and 4 months old, and he’s reading. Toddlers can start to learn reading. If the question of when should you start teaching pops into your mind now, run through my article on When Kids Learn to Read? Toddler Can’t Sit Through? Toddler Keeps Turning Pages? Okay, let’s say now you’re all ready to read to your toddler, what’s next? Don’t give up if your toddler doesn’t seem as enthusiastic as you are. There are some common problems when it comes to toddlers and reading to them. Toddlers, well, just have much shorter attention span. Break up your reading time into tiny chunks. Maybe four 5-minute of reading together peppered throughout the day. Or two 10-minute sessions if your child can sit that long. In these instances, I would start with children picture books with very few words in them. Let’s begin with developing some foundational early literacy skills, rather than distracting the toddler with complex narratives. You can save your chapter books or car instruction manuals for when he’s older. Colorful picture books will capture his attention so much more, and these books are usually busy enough to hold your toddler’s focus. Ask him to point to the pictures to keep him from eagerly turning the pages. To him, it might be his way of interacting with the book and you, and also for him to get great at flipping through pages. Hey, babies aren’t born with the skill to flip through pages, It’s another learned motor skill. Each day, preferably at a designated time, one of the best timings would be before bed, pull out a picture book and go through it with your toddler. Point underneath the word as you read it. Then point to the picture to show the association between the word read and the image. Ask your toddler open questions such as “Where is the rabbit?” to help increase reading comprehension. After some time, gradually progress to books with short sentences. Don’t groan out loud or roll your eyes if your toddler has a favorite book and want you to read it for many days in a row. Repetition would help your toddler to associate letter sounds with the text. Besides repetition, rhyme and rhythm would help a toddler to remember the story much better. The 3Rs, rhyme, rhythm and repetition would help young children to pick up the storyline and could well turn into their favorite. Get the sight of books to become a part of your toddler’s life, if it isn’t already a familiar sight. Let your toddler learn the basics of a book. The front cover, reading from left to right, turning the pages, and the back cover. How to Start Teaching Your Toddler to Read? If you’re keen on teaching your child to read at home, you can! One of the most effective methods to teaching young children to become fluent readers is through developing Phonemic Awareness (smallest units of letter sounds) skill. Let your child learn letter sounds, blend words, and sound out words. Let them develop the skill of decoding words. I started my son Kaden on a phonemic awareness based children reading program when he was 2 years and 3 months old. I’m not trained as a teacher, and I’m also not schooled in phonics. Without a program that lays things out in step by step for me, I don’t think Kaden would become an early reader that he is now. But this simple and effective reading programs allows me to learn how to teach my own son through very short and fun lessons. What are your thoughts about toddler and reading? Have you tried teaching your own toddler to read? What worked for your child? I’d love to connect and read your comments! 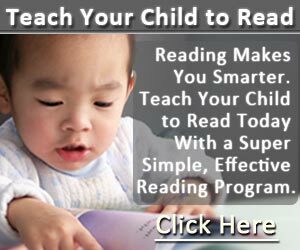 ← Does Early Reading Matter?